She was a disciplinarian, had a brilliant intellect, and was totally focused on preparing young children from the ghettos for Harvard and Princeton. And, she succeeded. I am in awe that she cared enough to give her life in service to others. The principles of reading instruction were timeless… they are consistent with what we all now cite as “reading science.” But, she did not suffer fools lightly. Her approach was definitive, direct, and effective. America and the world lost a great teacher, a dedicated leader, and a compassionate human being. Marva agreed to serve on the Board of The National Right to Read Foundation. We were truly honored that she would lend her name to the cause we both felt so passionate about, because we loved the little children who were being used as “guinea pigs” in a giant failed experiment in disproven reading pedagogy. This pedagogy has been advocated and implemented for much of the 20th Century, and continues today. 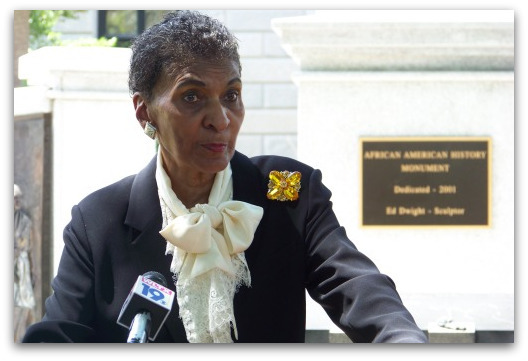 Let us all pick up the torch of reading freedom that Marva carried so courageously during her lifetime. The Marva Collins Way and other publications are available for others to apply and model. The best thing we can do to honor Marva Collins would be to emulate and replicate her educational practices. Her books are available on Amazon now. Marva Collins died on 24th June 2015, in a hospice near her home in South Carolina. She was 78. This entry was posted in News and tagged Marva Collins, The Marva Collins Way, The National Right to Read Foundation on 2nd July 2015 by Anne Glennie.